Gdansk, Poland - Holders Spain were held to a 1-1 draw by a dogged and determined Italy at the Arena Gdansk here on Sunday in the opening Group C match at the European Championship. Italy took the lead on 61 minutes through substitute Antonio Di Natale only minutes before the world champions equalised through Cesc Fabregas. But Chelsea striker Fernando Torres missed two glorious late chances after coming off the bench to replace the goalscorer. A draw was a fair result as Italy were the better side in the first half and were fearless in taking the game to the world champions. Both coaches sprung a surprise with their team selections as Vicente Del Bosque opted to go without a striker, playing Fabregas between Andres Iniesta and David Silva. Italy's Cesare Prandelli opted for Juventus reserve Emanuele Giaccherini in the left wing-back position, a role the forward is far from used to playing. And the surprises continued until after kick-off as Italy were the better side in the first period. Spain clearly lacked a striker and were guilty of over-playing the ball on several occasions. Italy kept it tight, dropping into a back five with three in front of them when they didn't have the ball. But they showed no fear when claiming possession and attacked with gusto. Andrea Pirlo had the first sight of goal when his low free-kick was palmed away by Iker Casillas on 13 minutes. Claudio Marchisio put Antonio Cassano in down the inside right channel but the AC Milan forward's shot on the turn from a tight angle screwed wide of the far upright. Iniesta had a low shot that Gianluigi Buffon gathered comfortably at his near post but otherwise Italy were far the more dangerous. Casillas spilled a shot from Cassano before Mario Balotelli was harshly adjudged to have fouled Gerard Pique as they tangled over the follow-up. Cassano then picked out Marchisio, whose first time volley was spectacular but straight at Casillas. Spain came alive a minute before the break as Xavi picked out Iniesta inside the box with an arrowed pass but his Barcelona team-mate shot too high. The chance of the half came in time added on as Cassano crossed from the right and Thiago Motta's header from point-blank range was somehow kept out one-handed by Casillas. Del Bosque must have said something to his players at half-time because within five minutes of the restart Fabregas had taken aim and brought a sprawling save out of Buffon. Soon after, Iniesta's shot from the left was deflected just past the far post. But then a Sergio Ramos mistake presented Balotelli with a free run on goal but the Italian was too casual and the Spaniard rushed back to redeem his error. It was the carefree Balotelli's last contribution as he was promptly hauled off for Di Natale, and not before time. Di Natale's first act was to beat the offside trap on 61 minutes to meet Pirlo's precise through ball and clip home beyond Casillas. That seemed to wake up the holders, though, and a clever move saw the ball shift quickly from Iniesta to Silva and then the breaking Fabregas to finish under Buffon. Del Bosque finally brought Torres on for Fabregas but when presented almost immediately with a one-on-one chance he overran the ball and Buffon cleared the danger. 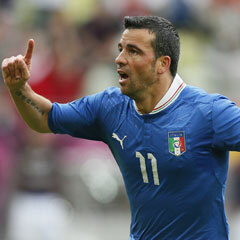 A dinked pass from Sebastian Giovinco, on for Cassano, freed Di Natale but his volley on the stretch went well wide. From another Italian defensive mistake Torres was presented a glorious opportunity but instead of playing in the unmarked Jesus Navas, he chipped Buffon and the bar.